Varanus melinus is a member of the subgenera Euprepiosaurus. It is very close related to V. indicus, but it is very easyly to be distinguished by the yellow coloration. LENGTH: This species can reach a total length of 80-120 cm. COLORATION: The coloration of the head, back, legs, and tail is a bright yellow. A black reticulation starts at the lower third of the neck and is most prominent at the body. There some yellow spots, sometimes forming yellow ocelli, are ordered in regular cross row over the back. The tail is banded alternately black and yellow on the first two thirds, getting more pale in the lower third. The underside from head, throat, body, legs, and tail uniformly pale yellow, only on the throat a light black reticulation is visible. 124-130 scales are around midbody. The nostril is situated closer to the tip of the snout than to the eye. The tongue is uniformly light pink. DISTRIBUTION: restricted to the the island of Obi in the Moluccas, Indonesia. But because these data are only known by the dealer, who shipped some animals over to Germany and the USA, it is no sure, that it is correct (BÖHME & ZIEGLER 1997). It is also reported, that V. melinus might occur on the Sula Islands, western Moluccas. V. melinus also might occur on Taliabu, Bowokan, and Banggai Island. FOOD/ HABITAT: Meat almost any kind, eggs (cooked so the risk of Salmonella is lowered), mice, rats, crickets (when small), fish, giant meal worms and I have found that canned cat food is similar enough to the canned monitor/tegu food to be fed. They are scavengers also so if you see that they don�t eat right away don�t be alarmed. I feed her twice a week but it can vary on size and what you are giving, if you give a big meal don�t feed them the next day if it�s a small meal maybe feed in another day or 2. IN CAPTIVITY: Because Varanus melinus became known to the public and science only some years ago (BÖHME & ZIEGLER 1997) only very little is known of the captive husbandry of this monitor lizard. DEDLMAR & BÖHME (2000) desccribed the first capive reproduction of this monitor. They kept 2.4 specimen in several enclosures, each measuring 180 x 110 x 200 cm with a water basin measuring 125 x 110 x 50 cm. The side and the back walls are covered with cork plates. Some big trunks and some plastic plants are for climbing and shelter for the animals. Mice and big locusts build the major diet for the monitors. Live fish were never taken, but fish fillets and prawns were always welcome. In April 1999 one of the females laid two unfertile eggs. The same female laid again 6 eggs inAugust of the same year. All eggs were fertile and after an incubation of 168-171 days at an incubation temperature of 28.5°C five babies hatched. The other one just died about 10 days before hatching. The offspring had a total length of 210-220 mm and had a body mass of 21-23 g. Some days after hatching the youngsters started to feed on house crickets. About one month later the first pinkie mice were offerd and taken. No further problems were reported. Can grow up to Five feet long in total. There are black spots on the body and the tail can be banded. The teeth are really shapr and can draw blood easily but the bites don’t hurt much. They’re skittish and handling them can calm them down. Catching them wild might take them longer to calm down. They still want to run and hide. They have long sharp claws that will scratch your arms. Tail whipping and bowel evacuation are also defense mechanisms. Males have hemipenal bulges and females don’t. WATER NEEDS: A Large water dish big enough for them to swim in, which needs to be changed daily as they will get it filthy with dirt and feces. They love to dig and create burrows. 3 or 4 feet of soil or soil mix would be good. Include a hide box and include lots of branches. They love to climb. The bigger the tank/enclosure the better. LIGHTING: I have a combination strip light with florescent and incandescent light bulbs. Never go over the suggested wattage of the light fixture. Day cycle should be on around 10-12 hours and the night cycle should allow for cooling, but not too much. The light bulbs should be ones made for reptiles so they get the added UVA/UVB that is important for proper health. TEMPERATURE: A basking spot of up to 125 or more. The rest of the tank should be from around 95 to 80 and the humidity should be kept high. On the Island of New Guinea. Blue tail monitor and the mangrove monitor. Each of the three use different parts of new guinea’s habitats. Preferences: dense forests; for they’re excellent climbers. Frogs, lizards, insects, any small animal they can overpower. They can get up to 4 feet long in total length. They can live up to 15 years. They take a while to tame and adjust in captivity, like most other lizards. The cage would need several hiding spots for security purposes. They should be maintained between 85 – 90 degrees with a basking spot of 95. At night temps shoudl be about 75. Bark or coconut bark is best, because it holds moisture well and duplicates the natural environment. Feed them mice, rats, fish, crickets, hardboiled eggs. Four or five times a week will ensure proper growth and health. Make sure to give them a calcium suppelement. The peacock monitor was only described as a new species in 1999! 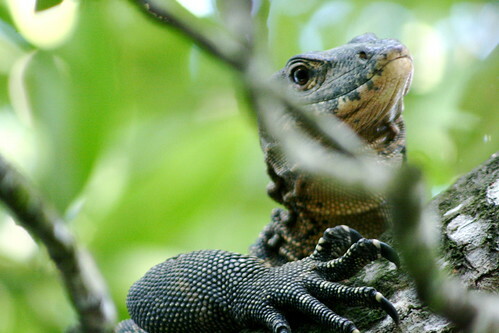 But it’s not that different from Varanus Timorensis, or the Timor Monitor (Spotted Tree Monitor). The coloration and spot pattern as the only difference. The difference is the blue grey ocelli, whereas the Timors are creame colored, and they don’t have a pattern on their underside. The Peacock has some pattern on its bottom side. The color up top is dark grey. Numorous ocelli, (photoreceptor organs on animals; spots that sense light but not its direction). They have central spots, often light blue to grey. A red brown pattern is visible otherwise. Strangely, these patterns fade after keeping in time in captivity.After this period, its hard to differentiate between the two. In number, there are as many as there are Timors. It’s length is up to 60 cm, or about 23.5 inches.The tail is relatively fat and round in cross section. Light scales form an irregular pattern. The Peacock Monitor is mainly located on the island of Roti, Southwest of Timor. 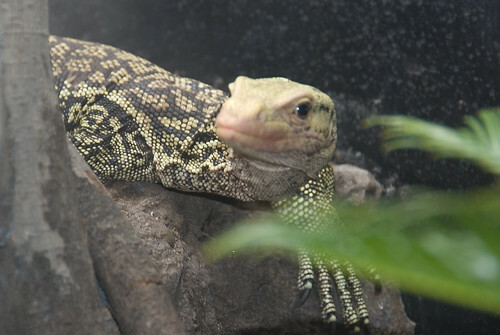 In captivity they are relatively shy, but are not much different than taking care of the Spotted Tree Monitors. We’ve wanted these small monitors for some time and finally have them. Without a doubt, these are the most elegant small monitor around. There outgoing attitude makes them irrestible to anyone that has had the pleasure of handling one. They often run up your arm and sit on your shoulder when you open their cage door. Yet another Australial gem. Kimberley’s are known to inhabit the extreme north of Western Australia and the Northern Territory. 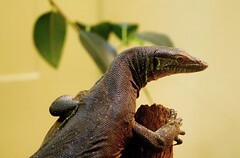 Their grace and beauty make them one of the most sought after varanids in the hobby. The color and pattern are rarely captured in photographs and need to be seen to be appreciate to the fullest. This stunning monitor reaches 60-70 cm TL. An insect and rodent based diet serves them well in captivity. Although sometimes a challenging feeder, kimberleys are worth the effort. Our male and female are both very mellow and a joy to keep. When it comes to beauty, Kimberleys are second to none. Their slender build and extreme contrast in pattern are sure to catch your eye and pique your interest. Still very rare in private collections, this monitor is for the discerning keeper who wants to add rarity to their collection that will set them apart from the crowd.. 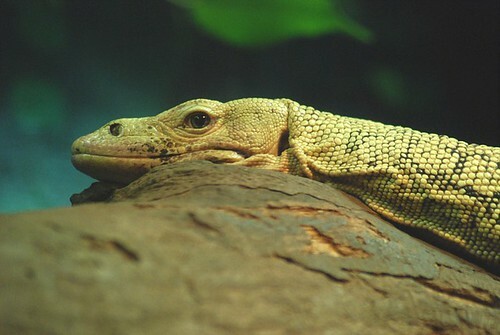 The Savannah Monitor (Varanus exanthematicus) gets its Latin name from the large, flat oval scales on the back of the neck which could be said to erupt, and its common name from the impression that it lives on the African savannah in the wild. 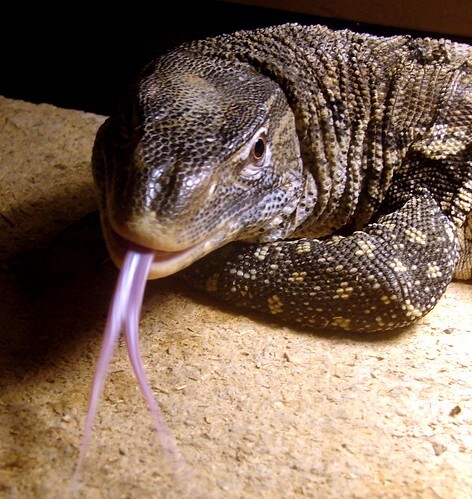 The term savannah monitor is also used in reference to several other species of savannah-dwelling monitors. In the U.K. the species is often known as “Bosc’s Monitor Lizard.” It is a robust creature, with powerful limbs for digging, powerful jaws and blunt, peglike teeth. Maximum size is rarely more than 100cm. Its diet is much more restricted than that of other African monitor lizards, consisting mainly of snails, milipedes, orthopterans, beetles and other invertebrates. The only vertebrates regularly consumed are amphibians. Its range extends from Senegal as far as Eritrea and northern Zaire. Varanus exanthematicus is primarily a ground dwelling species that shelters in burrows, although they are sometimes found in bushes or low trees. In the coastal plain of Ghana juvenile Varanus exanthematicus are often associated with the burrows of the giant cricket Brachytrupes. This species is readily available in the pet trade. Juvenile animals are collected from several countries in West Africa (mainly Ghana, Togo, Benin and Nigeria) and exported worldwide. Animals sold as captive bred, captive farmed or ranched are the offspring of gravid females collected during the breeding season whose eggs are incubated by exporters. 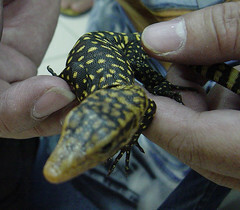 Adult specimens frequently become unwanted pets and are reported as being the most common monitor lizards by animal rescue agencies. However the vast majority die within a year of capture and captive breeding is very rare. The skins of the species are important in the international leather trade and originate mainly from Chad, Mali and Sudan. Bosc’s Monitor is often confused with the Whitethroat Monitor (Varanus albigularis) which can grow to lengths of 5-6 feet. While similar in overall appearance, this species possesses significant morphological and ecological differences and is recognized as a very distinct species. The salivary glands of many, if not all, species of monitor lizards produce venom in very low concentrations with vestigal function (Fry et al., 2006). The effect of these proteins on humans is negligible and the animals are not considered venomous. Complications arising from lizard bites are almost aways the result of infections.